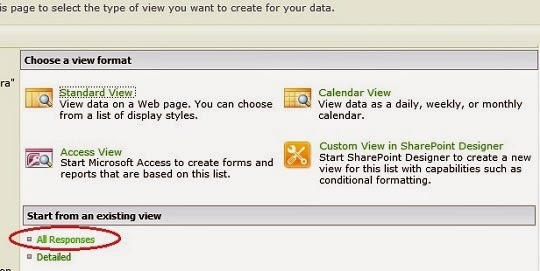 As you all know creating a custom view for SharePoint in-built survey list is not there by default. But this is a required feature in some cases. For example if you want to filter survey responses by an answer to a particular question, then having a view with that question is handy. 01. First of all find the survey ID. We can do that by navigating to survey settings and Find query string parameter “List” from the browser URL. 03. In order to create a new View, click on “All Responses” link from “Start from an existing view” section. 04. In the Create View page, provide a “View Name”, select Columns and set any other settings. Click OK.
“Detailed” is the custom view that I created and shown in the above screenshot.